Presumably taking its name from Max Rockatansky’s car of choice in the film ‘Mad Max 2’ ‘Interceptor’ is the German quartet’s eleventh full-length album and their sixth since getting serious once more in 2006. 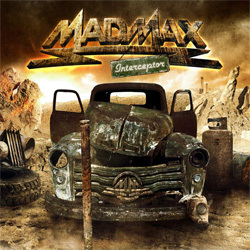 As ever with Mad Max’s albums the content belies the hard-nosed image conjured up by the band’s name (and the cover art which brings to mind the aftermath of ‘Mad Max 3’), and ‘Interceptor’ is once again a banquet of ten gloriously produced, slick and radio-friendly rock songs. Inoffensive and immensely likeable, ‘Interceptor’ strolls along at a pleasant pace, passers-by doffing their caps to its hugely-hummable choruses and elegant solos. It’s quite derivative in places, true, but the songs are cleverly written and beautifully executed, and every one could be a single – and a hit, in days gone by, come to that. The only downside is ‘Rokker Your Life’ which veers too far into Def Leppard territory for me (one Def Leppard is more than enough, thank you), but that aside Michael Voss and his band mates Juergen Breforth, Roland Bergmann and Axel Kruse have come up with yet another crowd-pleasing offering. Opener ‘Save Me’ and the hacking riff of ‘Streets Of Tokyo’ certainly capture the imagination, and although ‘Godzilla’ isn’t a cover version, ‘Turn It Down’ takes the old Sweet hit and gives it a hefty kick up the twenty-first century.